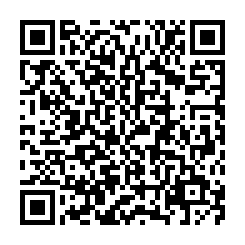 I'll be typing this blog in English for this particular entry, so here it goes. After spending 7 days in the capital of the Korean Republic and deciding to go on a solo trip, it is finally time to return home, or my Singaporean home that is for this matter. Fot this segment of the trip, I decided to spend a few months of my NSF allowance to upgrade my return flight segment up to business class after that somewhat interesting Economy class experience I have had the previous time. Waiting for the shuttle bus from my hotel to Incheon. 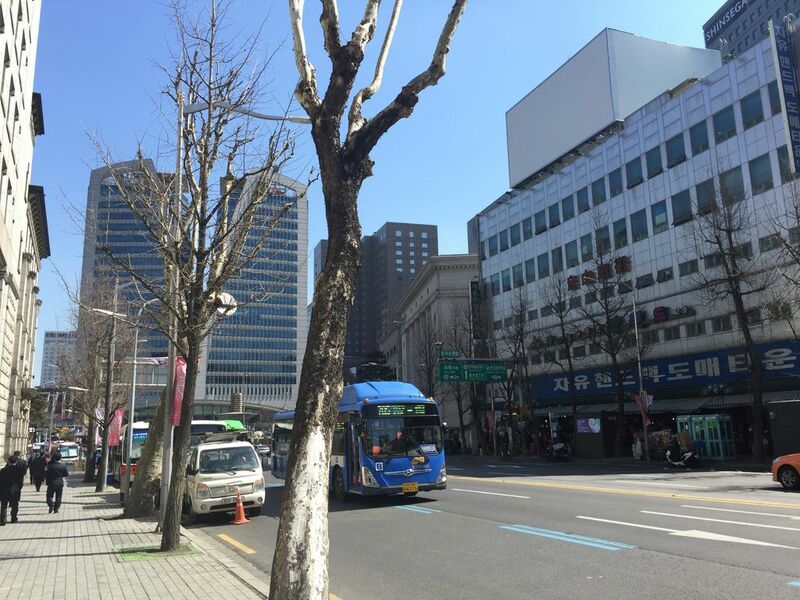 The friendly Shin Shin Myeongdong Hotel staff informed me that the shuttle bus came at regular intervals of 20 minutes and I pushed my heavy luggage to the bus-stop at the main road which was a short 3 minutes walk from the hotel two minutes before the bus arrival time. 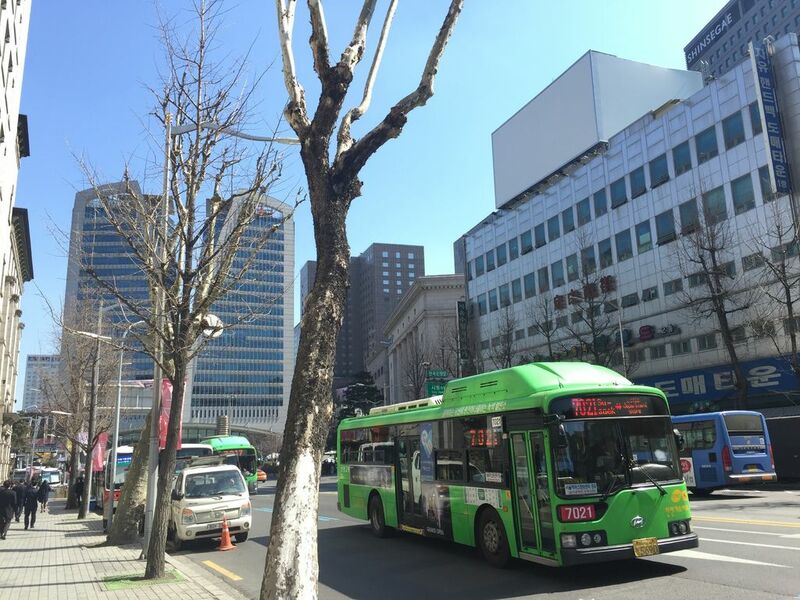 I was told by a Korean lady who was also heading to Incheon that the previous scheduled shuttle bus failed to arrive and she was anxious to get to the airport as her flight to Osaka Kansai was in a mere 2.5 hours time and she suggested that we share a taxi if the next bus failed to arrive on schedule. The next shuttle bus came but it drove off as there was a car which was parked at the bus bay and this left the lady and I speechless, we then decided to wait for the next bus as we were told that the next one would arrive in 5 minutes. Luckily for us, we successfully boarded that bus and off we go to Incheon. 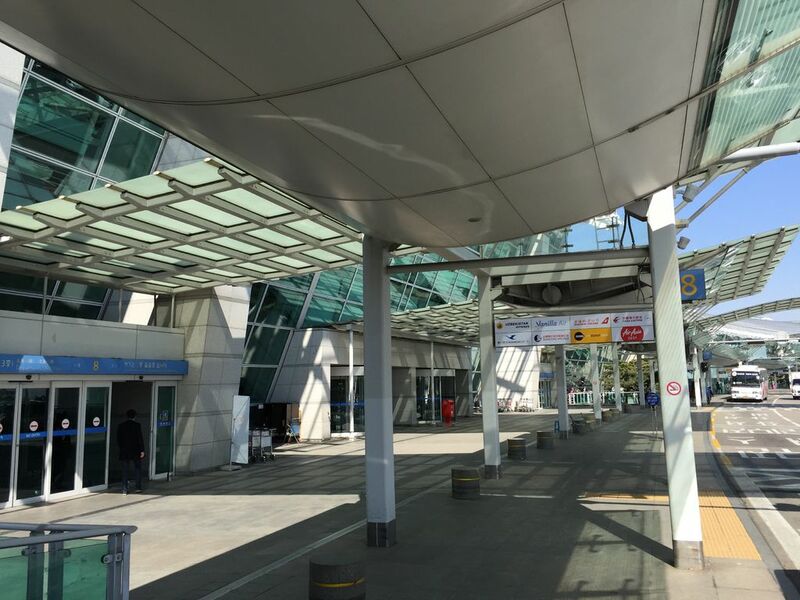 The airport shuttle bus stopped at a short pit stop at Incheon before reaching Incheon Airport. 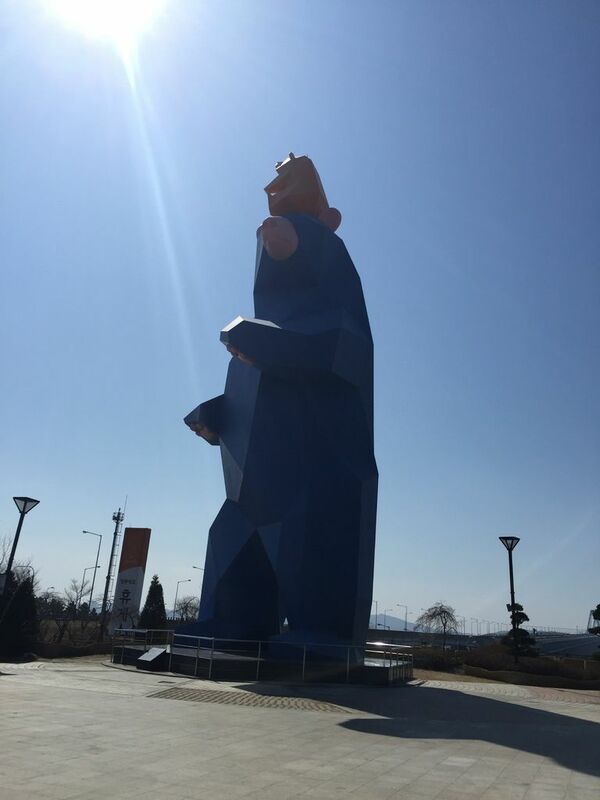 The bear statue is apparently the biggest and tallest in the world, true story. There is also a wind-farm near the place as well. 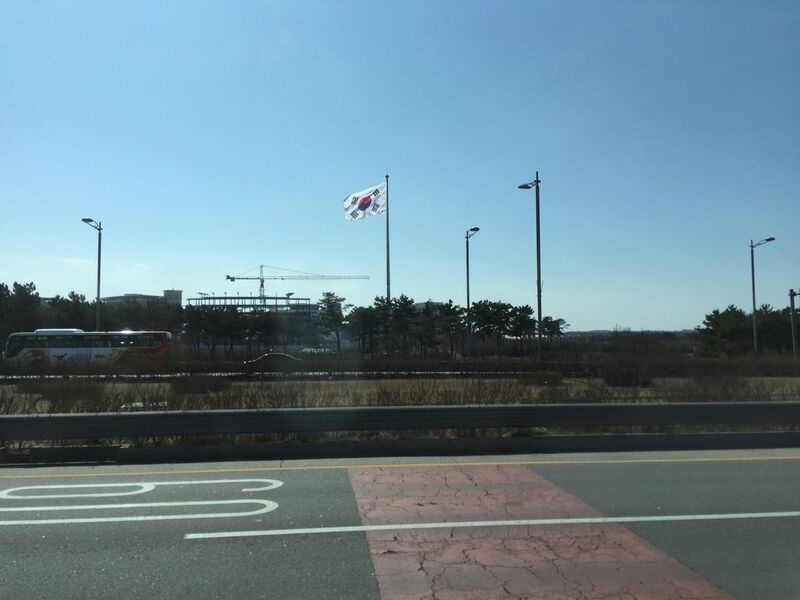 A huge taegu-ki near the airport. 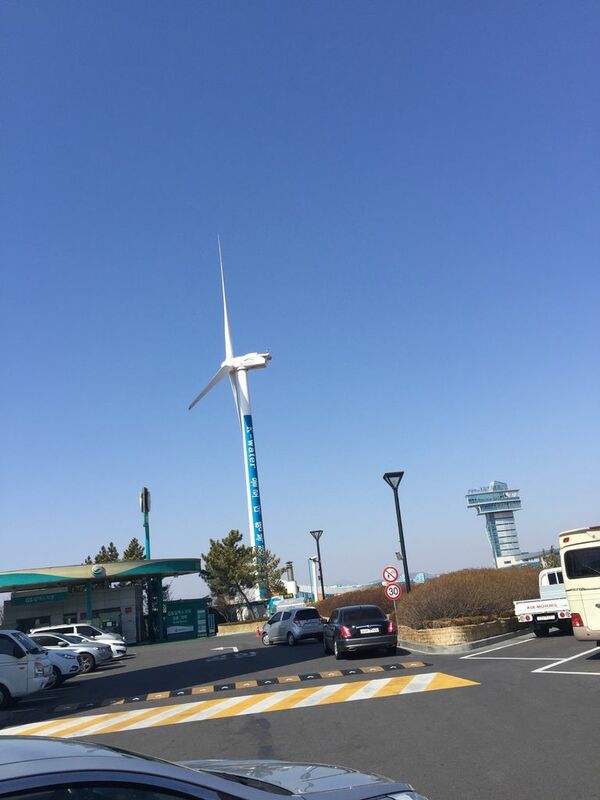 Thanks to smooth traffic, I was able to reach Incheon Airport in 45 minutes. 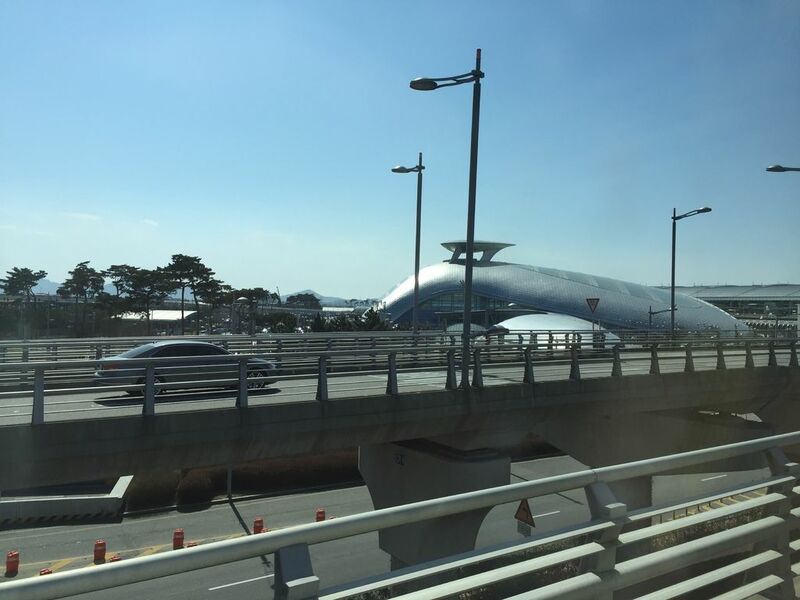 The terminal building at Incheon Airport sure looks futuristic and modern. So I headed off to check-in, at the specialized Business Class counter of course. 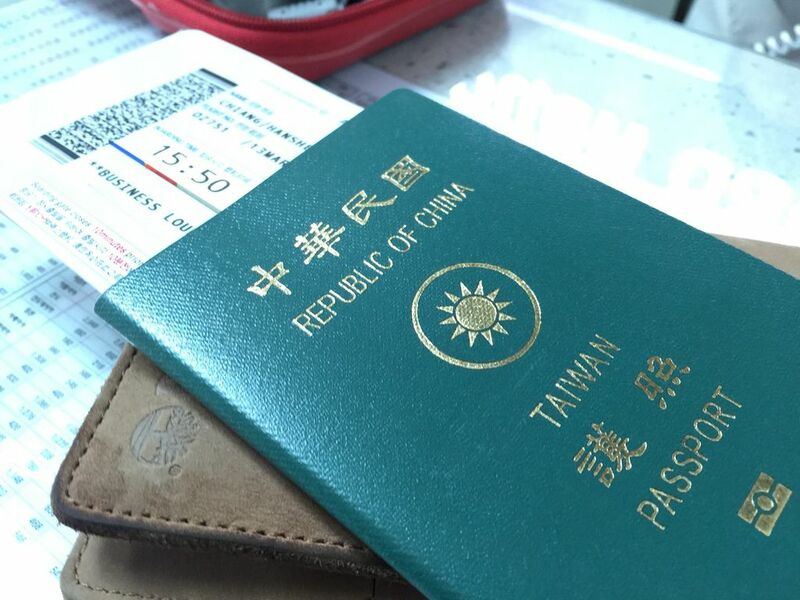 Though I completed my 2 years of National Service in Singapore, I am in fact a true blue national of the Republic of China (Taiwan), just look at my lovely green passport! For this flight, I took the glorious window seat on the first row, yes you are right, the very first row of the plane and by a stroke of luck, the A333 that is taking me back to Singapore today is the exact same A333 that took me to Incheon from Singapore just 7 days back. After completing the check-in procedure, which had literally no queue since Asiana dedicated an entire check-in row to Business Class passengers, I proceeded to complete the tax refund procedures and complete the immigration procedures. For those who went to Korea before, you should know that Korea has a rather unique procedure for tax refund. 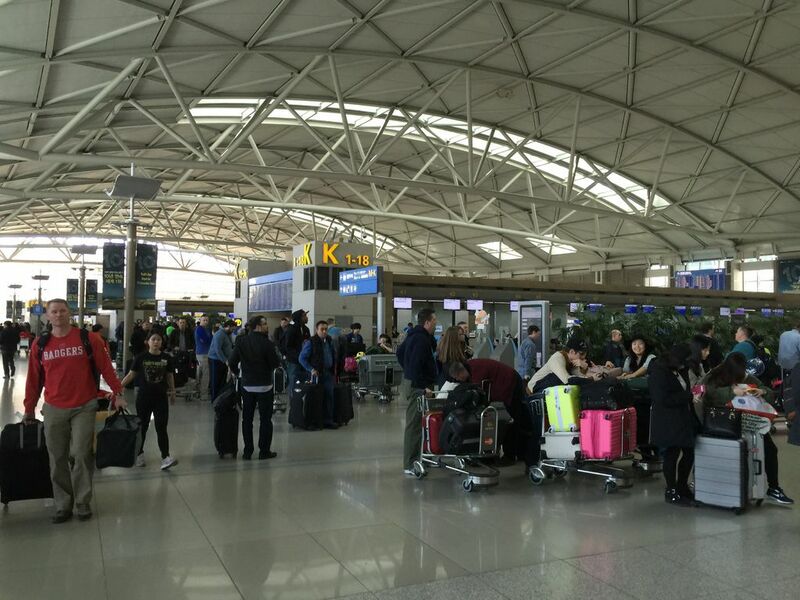 One has to complete the check-in procedure to obtain the boarding pass and check in the baggage without the duty free items and then proceed to the specialized tax refund corner with the boarding pass and the luggage containing the duty free items. 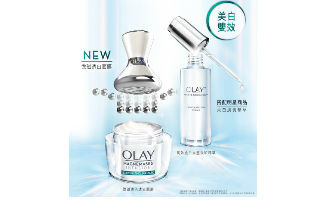 One then has to submit the tax refund forms to the customs for endorsement and show the items to them when told before finally checking in the remaining baggage. For tax refund items which are to be hand carried, one has to have the tax refund form endorsed by the ROK customs after the completing the immigration procedure. The money will be refunded at various counters located at the airport transit areas. Well in conclusion, I took half an hour to complete my tax refund process due to the long queue and the massive confusion of the tax refund process. 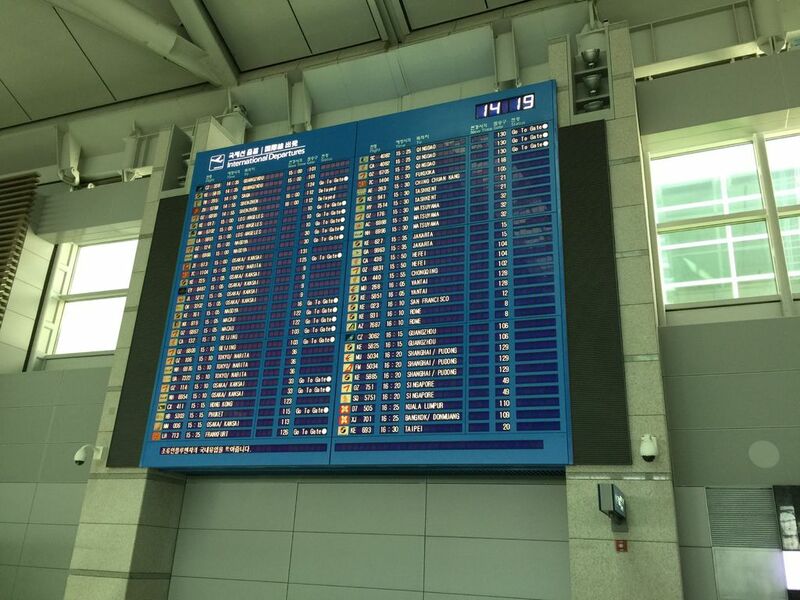 That is one major point I noticed about the award winning Seoul Incheon International Airport, the signage at the airport was often unclear and the supposedly friendly Airport information counter staff can often be slightly disappointing. After a short queue at the immigration counters, I walked through the automatic door and there I saw them. 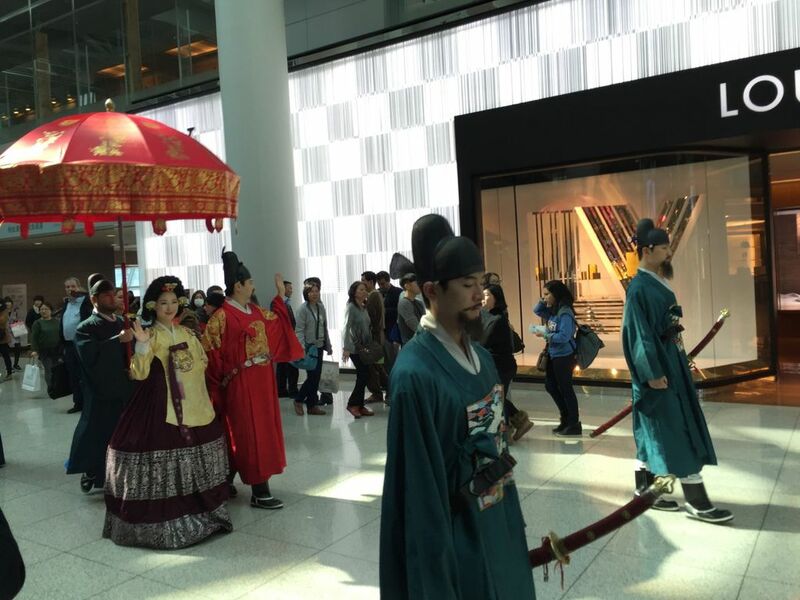 Who else was there to send me off but members of the Imperial House of Joseon, the house of Yi. Presenting the King and the Queen with their royal entourage. Presenting the Prince and the Prince's Consort with their royal entourage. Gosh this really reminds me of some generic scene from a historical Korean drama. 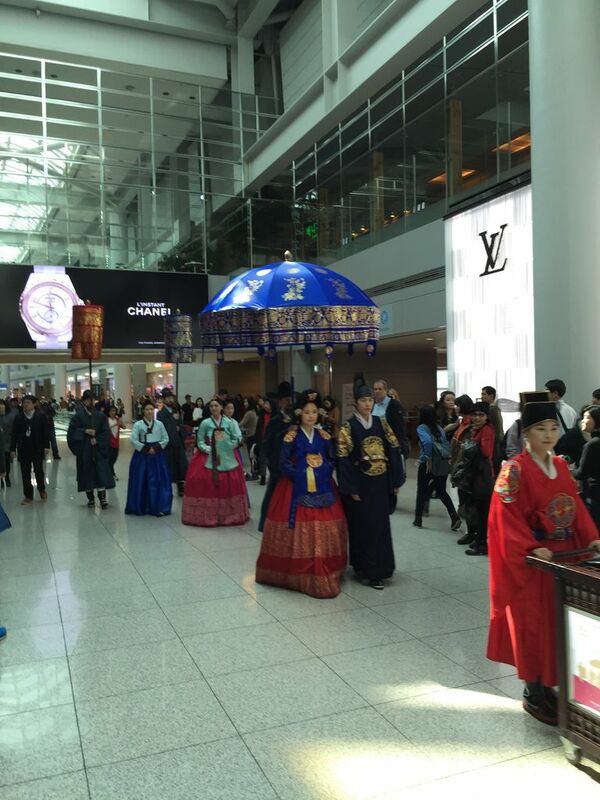 Korea sure has got it right by having this marvelous addition to the renowned airport. 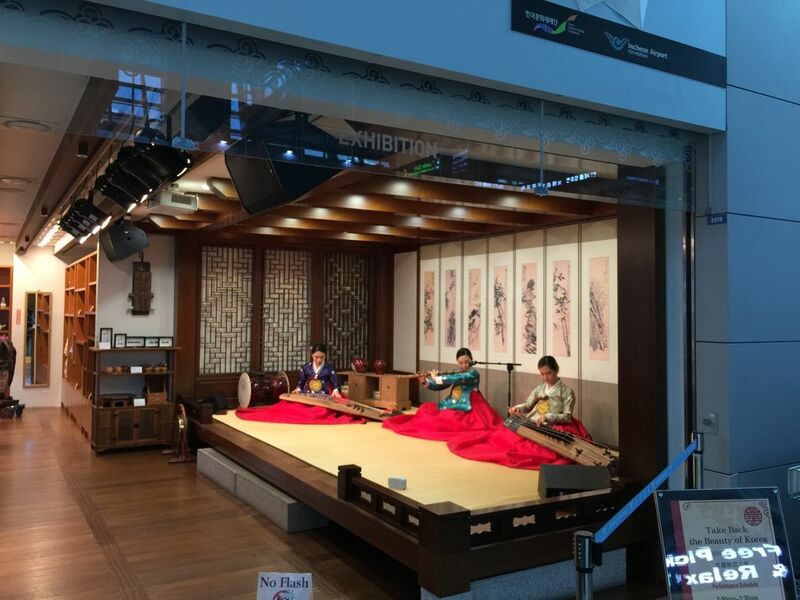 Right beside the Louis Vuitton store, which is a first in an international airport, is the Korean Culture Experience area, where musicians are playing some classical musical instruments. On a side note, don't you think these instruments look like classical Chinese ones? 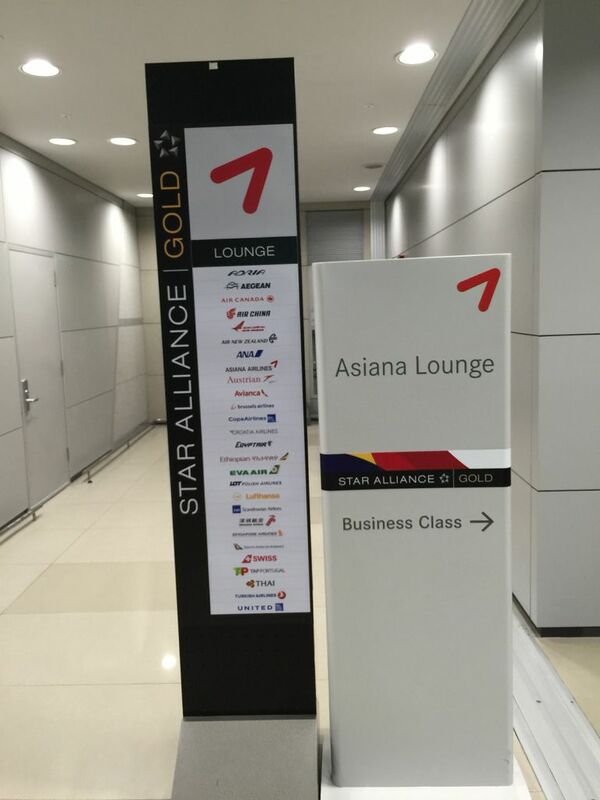 Following the signage, I proceeded to the Asiana Business class lounge. Just look that the amount of star alliance members, no wonder it is the world's largest airline alliance! The interior of the Asiana Airlines Business lounge offers an abundance of seats, a wide array of publications (both local and international), a shower lounge, internet access, and last but not all food. I was slightly disappointed by the variety of food or the lack there of that is. My apologies for the lack of pictures of it but in the end, I ended up munching on nachos, having some friend rice, and having a sprite as a beverage. So after consuming my meal, I started my journey to the boarding gate 49. After a 15 minutes walk, I reached gate 49 which was at the end of the concourse and there were so many people who were already present at the gate and boarding for the flight has commenced, guess today's flight will be a full one too. As a business class passenger, I have the privilege of skipping the entire queue and proceeded right to the ground agents with my boarding pass for boarding, much to the stares of the other passengers. Hello Asiana Airlines HL7746, we meet again. After taking the escalator to the boarding level, I turned right to the first entrance. After being greeted by the beautiful Asiana Airlines attendants, as they call themselves, I was directed to my seat 1K. I was greeted by the chief purser personally, who identified herself as Kim, and I was told that the air attendants were there to attend to my every needs. The seat which Asiana Airlines chose for its A330-300 was similar to the shell angled recline seats that China Airlines use as well and the screen of the IFE system was adequately large for a regional haul. I chose a simple apple juice to start the flight, nothing alcoholic yet. The plane next to mine was bound for Hong Kong International, yet another destination which I have yet to visit in a few years. The flight pushed back and took off 10 minutes after the scheduled timing and once air-bound, I adjusted my seat to the angled reclined position, lowered the window shade and dozed off. When I woke up after a 50 minutes nap, it was dinner time and the air stewardesses were busy serving meals. This was the appetizer that was offered; smoked salmon with a tinge of lemon, salad with Italian dressing, and bread. For beverage wise, I chose red wine (apologies for the lack of name), and a glass of water. The main course, I chose beef steak with asparagus, chopped carrots, and mashed potatoes instead of the other option which was bulgolgi bibimbab. The steak with slightly dry and the vegetables were slightly overcooked but overall acceptable and quite delicious. The post main course fruits was served with cheese and crackers. After which, ice-cream was served as desserts and the flight attendants went started their routine round of beverages. Dusk as seen from the plane. 5 hours into the flight, everyone started to get hungry and other passengers started ordering ramyun. I ordered a nice piping hot bowl of black shin ramyun, an awesome meal I must say, highly recommended! With that, the flight started to begin its decent onto Changi. Arrived! Thank you HL7746, till we meet again at some airport around the world. 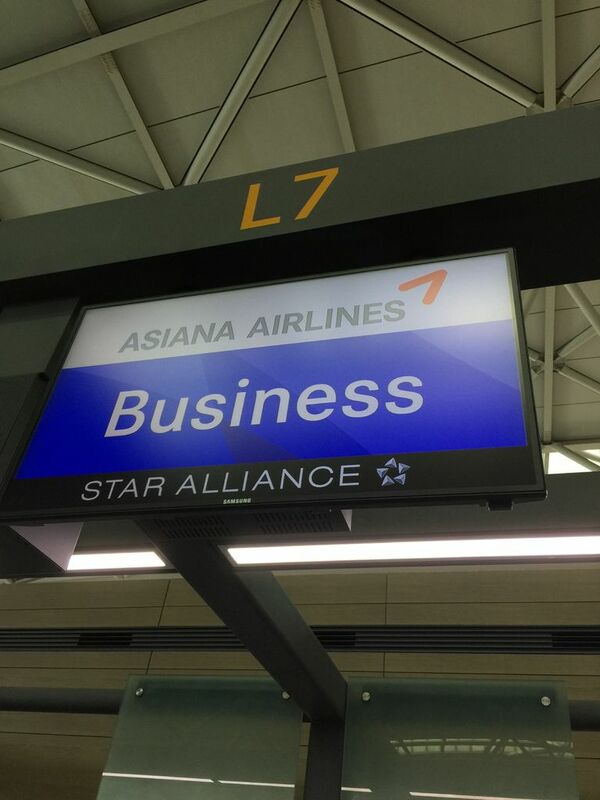 Concluding thoughts: This Asiana Airlines business class experience was truly better than the previous Y class experience I had, however this of course came at quite a big expense as I paid nearly twice the original fare for the upgrade. However, the IFE was quite awesome for a regional haul and the service was excellent.The in flight meal however was slightly disappointing as its portion size and variety was lacking but the black shin made up for it.